New research shows that the large fault off the Northwest coast is so weak and slippery in places that minuscule tidal forces produced by the sun and moon are enough to cause tremors. As the death toll rises from Nepal’s magnitude 7.8 earthquake, new research from the University of Washington shows that a similar fault off the Pacific Northwest is so weak and slippery in places that minuscule tidal forces produced by the sun and moon are enough to trigger tremors. The quakes involved are so tiny they’re imperceptible to people. But they’re part of a recently discovered process called slow slip that ratchets up pressure on the offshore fault called the Cascadia Subduction Zone — slightly boosting the risk of a megaquake and tsunami. The Cascadia fault and the one responsible for Nepal’s devastation are both boundaries where tectonic plates collide. In Nepal, the Indian subcontinent is being forced under Central Asia, while in the Northwest, the seafloor is diving — or subducting — under North America. 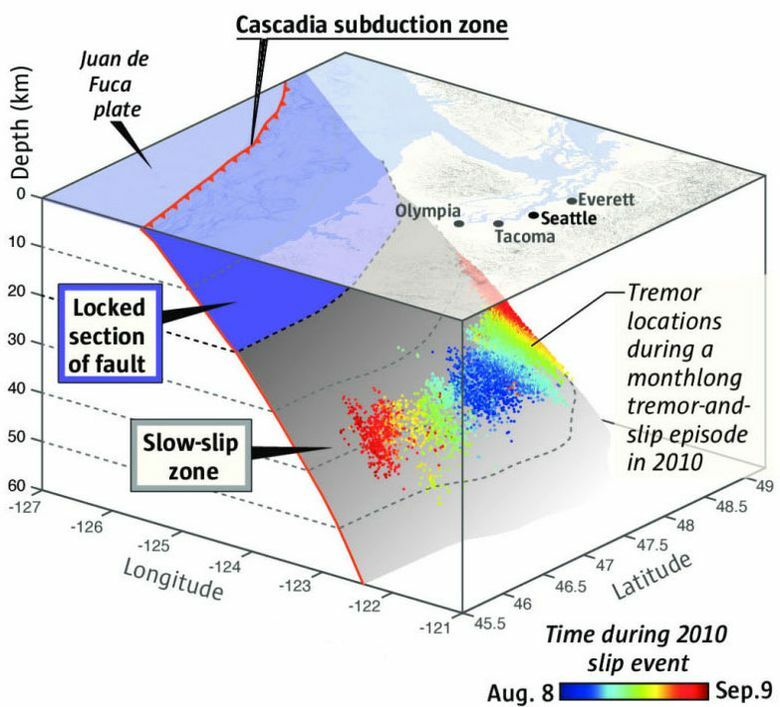 Even though the faults aren’t identical, geologists say the Cascadia analysis could help improve the broader understanding of when and how such plate boundaries rupture, generating some of the world’s most powerful quakes. For the study published Monday in the journal Nature Geoscience, UW geophysicist Heidi Houston analyzed tens of thousands of faint tremors under Washington’s Olympic Peninsula and Vancouver Island between 2007 and 2012. The tiny quakes occur when tectonic plates slip slowly past each other 20 miles or more underground. These slow-slip events last for several weeks and can propagate 100 miles or more north and south. The pattern repeats roughly every 12 to 14 months. Each slow-slip event releases as much energy as a magnitude 6.5 quake, but the motion is so slow it’s detectable only on sensitive seismometers and GPS stations, Houston explained. While the slow slip relieves strain deep on the fault, it adds a little pressure to the shallower portion — called the locked zone — that will unleash a quake of up to magnitude 9 the next time it ruptures. Scientists and self-styled seers alike have long been intrigued by a possible link between earthquakes and gravitational and tidal forces, said UW earth sciences professor Ken Creager, who was not involved in Houston’s study. The idea is that fluctuating tidal forces should raise and lower the strain on faults, causing them to snap. But despite decades of study, the impact on regular quakes has proved negligible. Creager and his colleagues were among the first to show that the story is very different with slow slip. They found a clear link between tremor rates and tide cycles in the complex topography of the Pacific Northwest. During some phases, the minute changes in pressure encourage tremor; during other phases, tremor is inhibited. Houston delved into the data in more detail and found that when a portion of the fault first begins to slip, it’s not very sensitive to tidal effects. But as the tremor continues over several days, the fault weakens and the tidal pull becomes a much more dominant factor. “We think the stress causes the fault to start slipping faster,” Houston said. As a result, little spots where the plates are stuck together break, generating the tiny quakes called tremor. The best explanation for the deep fault’s sensitivity to such small forces is that it must contain far weaker, more slippery rock than anyone imagined, Houston said. The presence of fluid is also key, allowing rocks to slide at depths where the pressure is so great it would otherwise clamp the fault shut. Overall plate motion during slow-slip events adds up to only a little more than an inch. And even when tidal forces are at their peak, as during king tides, the risk of a damaging quake remains very low, Houston said. But new insights into the frictional properties of the deep fault will help researchers develop better models to explain what’s going on down there and devise better experiments to simulate what might happen during different conditions. The ultimate concern, of course, is the shallower portion of the fault, where plates can jolt past each other by 60 feet or more in what’s called a megathrust quake. Japan’s 2011 Tohoku quake and tsunami was preceded — and likely triggered by — shallow, slow slip on an offshore fault. There’s some evidence of similar slip before a recent quake off the coast of Chile. There’s no proof yet that slow slip or tremor occur on the fault that caused Nepal’s weekend quake, but it wouldn’t be surprising, Creager said. Houston and other researchers are closely tracking Northwest slow-slip events, looking for potential danger signs like more intense tremor or motion close to the locked zone. “There is a possibility — but no guarantee — that there will be some enhanced tremor or slow slip prior to the (Cascadia) megathrust,” Houston said. Researchers are even discussing whether they should issue warnings if such worrisome signs appear. “Maybe we should tell people: We don’t quite know what this means, but we’re fairly certain the probability of an earthquake is bigger now,” Bürgmann said. But 315 years have passed since the last time the Cascadia fault snapped in 1700. Hundreds of slow-slip episodes — and countless tidal cycles — have played out since then without triggering a seismic cataclysm. The next slow-slip event is expected to begin sometime this fall or winter.